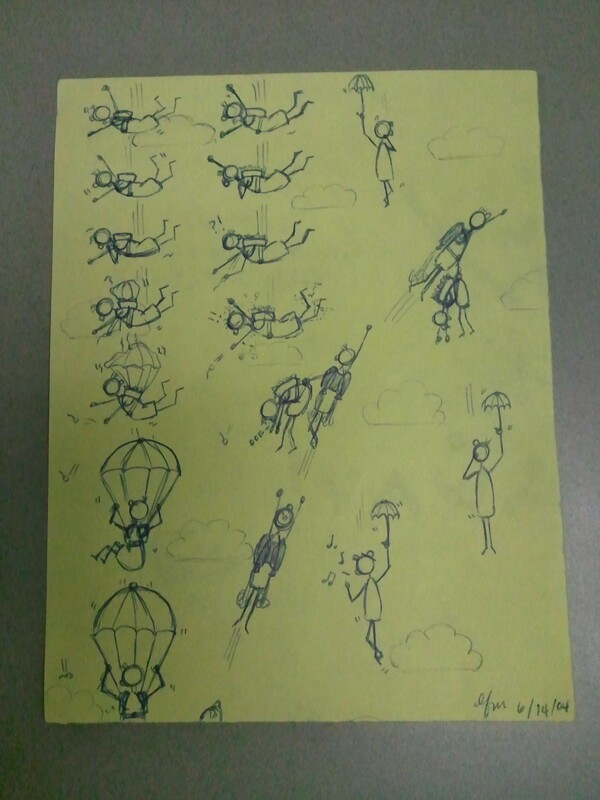 Jetpack guy saves the day! | Random moosages as I see fit. Jetpack guy saves the day! I had to go to a wedding this weekend, which involved all kinds of scurrying, last-minute activity. And then on Sunday, I came back to the house to find that the dogs decided they were really hungry and would try cooking themselves some lunch. It involved the demise of a 25lb sack of flour, a lot of rice, a small bag of tea, and some eggs. Needless to say, this involved a cleanup of monumental proportions. Then the dogs needed baths because they were covered in flour. Also, my dad decided that it would be a good time to assemble furniture. Not only that, he thought it was a good time for me to help him assemble furniture. And then move it. I’ve had a busy weekend and thus, I am the tired and it is seriously sapping away any motivation I had in reserve. So…instead of a thoughtful and detailed post about something strange, you get a doodle from 2004. I remember I had did this one night during class when I just couldn’t get myself to pay full attention to the matter at hand. I found this floating around my things recently and I am amused by it, even now. So…huzzah! A doodle!